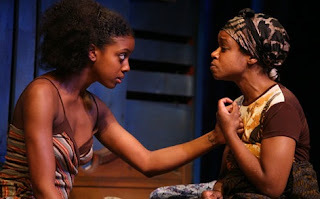 Lynn Nottage’s Ruined is an intense and sexually charged drama that draws the audience to the stage. Ruined tells the heroic tale of Mama Nadi and the young women she harbors in the war ridden Democratic Republic of Congo. While several factions of militia and rebel forces tear the villages apart and destroy the lives of its inhabitants, Mama Nadi discovers a way to remain safe—by consorting with these very factions. Set in a quaint village bar, the play begins in a rather lighthearted manner. Mama Nadi is busy cleaning when she is visited by the “Professor,” a salesman who brings her supplies such as lipstick and condoms. They discuss business in a humorous tone, but the mood shifts when The Professor offers Mama Nadi some additional cargo—Sophie and Salima, two homeless young women. It turns out that Mama Nadi provides more services than just food and drink. Her innocent pub is actually a brothel that serves all of the men fighting in the war. We soon meet Josephine, the most popular prostitute, who helps Mama Nadi run the business. Mama Nadi makes no distinction between those she welcomes, as long as they follow her one rule of not bringing loaded weapons into the bar. At first it seems that Mama Nadi is safe from conflict because she shows no loyalty to either side, but her flexibility makes her even more vulnerable. Sophie, Salima, and Josephine tell their stories throughout the play. Each story about their ruin is more heartbreaking than the last and moves the audience to sympathize with these women who must sell their bodies to the very men who stole them from their homes. Sophie, the most physically scarred of these women, is exempt from the usual brothel duties and takes on singing and bookkeeping to pay for her room and board. Her singing is the only soothing aspect of Ruined, the music of which exemplifies the essence of the struggle of the citizens of the Democratic Republic of Congo. Ruined pays homage to the women who have no voice of their own. It is as suspenseful as it is moving and will not disappoint. How to see the show: New York City Center, Stage I, 131 W. 55th St. Visit www.mtc-nyc.org for schedule and more information.